Democrats to GOP: Are You With Trump or With Survivors? The world is watching Connecticut as students and women across the nation are shocked by allegations against Brett Kavanaugh during his time at Yale University. 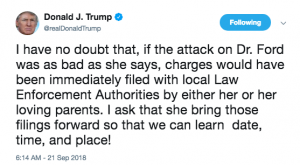 And today, Donald Trump doubled down on his claims that the newest allegation shouldn’t be taken seriously. As Connecticut is at the center of the national controversy, will candidates speak out to repudiate Trump? We know Bob Stefanowski gives Donald Trump an “A” grade, but this is a straightforward question: Do you stand with Trump and support Kavanaugh’s nomination? Or do you stand with survivors?